Carey Thomasson (pictured) and her husband, Dan Thomasson, opened their food-to-go eatery in May 2016. Journal photos by Jordan Wald. Carey Thomasson thinks there’s no reason to stress out about dinner. And maybe that’s the reason the name of her popular Crestline Village business ends with a period and not an exclamation mark. “It’s just dinner – don’t freak out,” said Thomasson, chef and co-owner of Dinner. 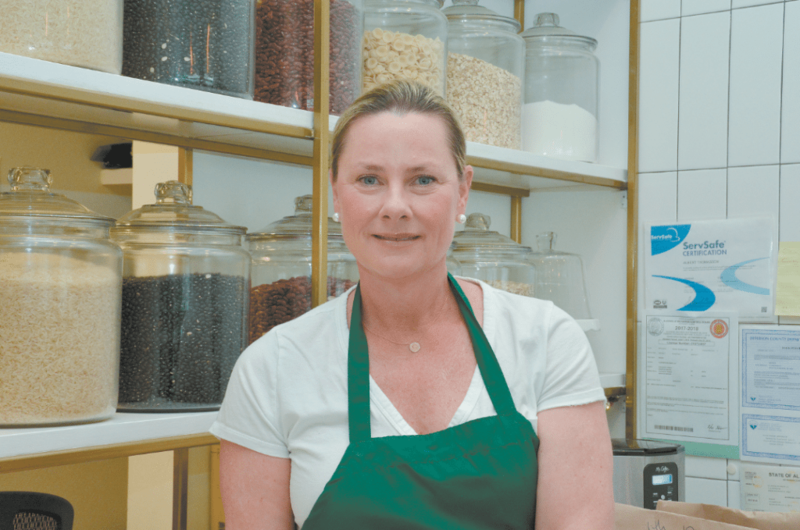 She and her husband, Dan Thomasson, opened their food-to-go eatery in May 2016. Main dishes, sides and desserts are cooked fresh every day and packaged to serve two to three people. 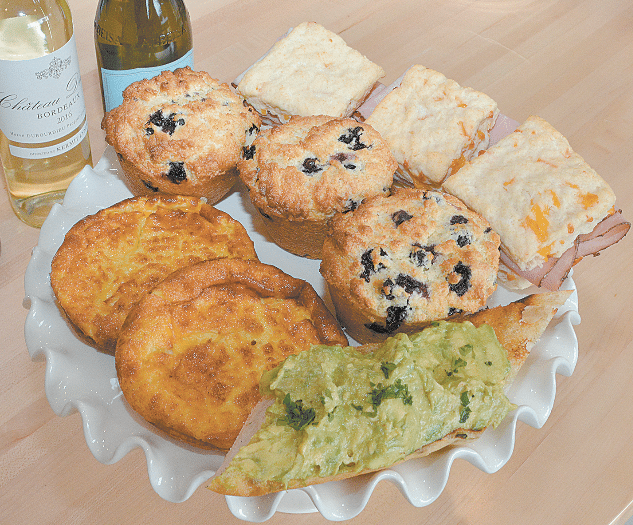 Dinner’s new breakfast menu will include dishes such as cheddar biscuits with ham, frittatas, blueberry muffins and avocado toast. Starting this month, Dinner customers will be able to eat in as well as take out. Those who dine in will be able to order breakfast and lunch. Carey said she’s especially looking forward to making and serving breakfast dishes like cheddar biscuits with ham, avocado toast and frittatas. Dan, who manages the business, is a Mountain Brook native who grew up just down the street from Dinner. Carey was living in New York when she and Dan met at a wedding. Even before that, Carey’s favorite place was the kitchen. Carey’s career in cooking has taken her from one side of the country to the other. “I moved to Los Angeles to be a movie star, but that didn’t work out,” she said with a smile. Instead of becoming a movie star, Carey made a name for herself as a private chef whose clients included celebrities. Marriage to Dan brought her to Birmingham in January 2005. She worked for about six months at Chez Fon Fon and Highlands Bar and Grill but stopped when she was expecting her first child. The couple’s son, Flynn, is now 11. Their daughter, Hollis, is 10. Both are students at Mountain Brook Elementary School. “Cooking pulled me back in,” Carey said about the decision to open Dinner. She and Dan found the perfect space at 73 Church St. Dan said it’s the former home of Gia’s Cakes, which moved to a larger location. The Thomassons pretty much gutted the space, making it bright and open. The concrete floor was stenciled to look like an Oriental rug. Shelves hold bottles of wine, which customers can buy to complement their meals. Baskets hold treats like Carey’s homemade cookies and Rice Krispies treats, and big glass jars are filled with pasta, dried beans and other ingredients. “I wanted this to feel like you’re in my kitchen,” Carey said. Customers can buy entrees that include panko parmesan chicken, salmon and grilled flank steak plus sides, desserts, soup and extras like deviled eggs and pimento cheese. 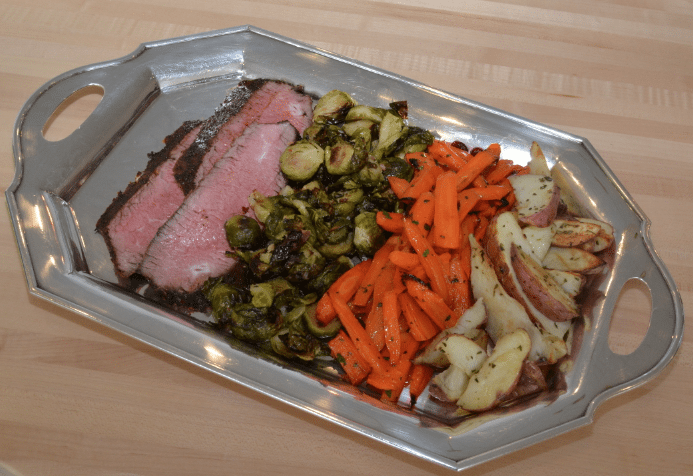 A complete meal option from DINNER: grilled flank steak, roasted Brussels sprouts, glazed carrots with cranberries and roasted new potatoes with rosemary. Although she expected most of her customers would be working parents, her business has been a hit with another group. “About 30 percent of our customers are empty nesters,” she said. You can check the menu by visiting the Dinner website and then stop by the eatery to buy what you want or call ahead to place orders. You also can get delivery service if you order before 2 p.m.
Another aspect of the business is hosting dinner parties for events like birthdays, bridal festivities and book clubs. Dinner’s slogan is “We made it for you,” and Carey hopes to make even more good food in the future. Carey said she thinks Dinner gives customers the opportunity to have tasty, well-cooked meals at home.